The Genting Casino Coventry Blaze have agreed two-way contracts with three young British players for the 2017/18 Elite League season. Renny Marr, who was Blaze's back-up goalie of last season will join Swindon Wildcats teammate Oliver Stone, along with Jordan Stokes who continues his two-way deal with the club. 19-year-old netminder Marr, spent two seasons on a full-time contract in Coventry before taking up an opportunity for more ice time with Swindon in the NIHL for the 2017/18 season. The Scot has iced in more than ten Elite League games and is the current number one for Team GB under-20’s. 18-year-old defenceman Oliver (Ollie) Stone, graduated through the Okanagan Hockey Academy as an associate Captain before signing a full-time deal with his home-town club, Swindon, where last season he iced 38 times. Finally, defenceman Jordan Stokes will remain on a two-way contract with the Blaze with his parent NIHL club to be announced in due course. 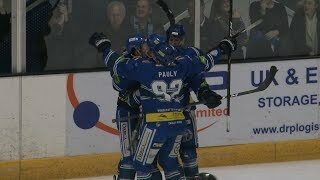 The 18-year-old who is a product of the Coventry Blaze Academy, spent last season with the Hull Pirates in the EPL, playing in near 60 games. During the year, Stokes also featured in several Blaze pre-season and Elite League games. Stokes, a selection for GB U18’s also holds experience playing for the Blaze and Solihull NIHL teams. All three players will spend most their time next season playing in the NIHL but will also train regularly with the Elite League Blaze team and be available for selection where possible. 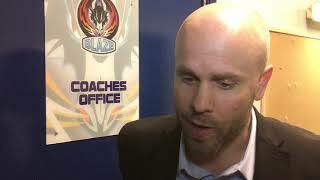 Blaze Head Coach Danny Stewart said, “To get some young kids involved on two-ways is hugely beneficial to us, and the players in many ways. In Renny Marr we get a goalie who is familiar with Coventry. He has done a great job as a back-up for us the past couple seasons, but now is time for him to get more game time and at Swindon he will do that. This two-way deal allows him to benefit from training with us occasionally throughout the season, whilst providing additional injury cover, and added depth for that position.